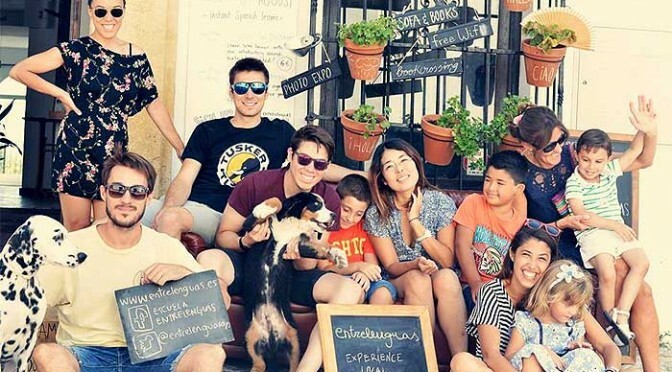 Learn Spanish in Ronda with Escuela Entrelenguas. With 495 million speakers, Spanish ranks as the world’s No. 2 language and the number of people learning this language is increasing rapidly – approximately 18 million students in the world study Spanish as a second language and statistics show that by 2030, 7,5% of the world population will speak Spanish (530 million people). ‘¡Levante el culo!’ The ward double doors crashed open and three starched nurses swept in. ‘Lift up your backsides!’ they shouted, an English approximation of the Spanish. A nurse called Paqui pulled off my sheet and said, ‘Buenos días, señor. Good morning sir. ‘Lift up your backside; I want to change your nappy.’ She wore an expression that would make a fighting bull bellow for his mama. ‘They think you’ve had two strokes,’ said Verne, my wife, two days before. ‘You are in hospital in Ronda being tested.’ Then she noticed that I was running a temperature, called a nurse and the alarm was raised. High temperatures don’t go with strokes. Between them they saved my life. ‘Puncture in the lumbar,’ grinned a large nurse who mimed skewering a chicken. I’ll give them this – they were quick. I was rolled over, Pablito was on top of me and the ‘knitting’ needle went in all in one movement. Later the Chief Medico arrived. ‘You have meningitis, Bernardo, and you cannot leave for three weeks. But you will be cured.’ So bang went our trip to Barcelona that we’d been planning. Then the 5th Cavalry, Roger, Verne’s son, arrived to help her. He too, fell in love with Ronda. Back in the sickbay, this morning in the dawn cold, I had wallowed in my own urine, trapped in tight plastic knickers. I made a last appeal to Paqui brandishing the fresh nappy. It’s no wonder babies cry. It’s not the wetness – it’s the cold wetness. ‘No, Bernardo.’ She lifted my legs like a baby, wiped here and there with a soapy cloth and clipped a new nappy on like a medieval chastity belt. ‘But with a bottle I would not require a nappy,’ I pleaded. One clings to little independencies when one’s freedom is all but gone. Silly me. Spaniards love Order and Rules are the Rails on which it Runs. The bullfight, for example, has dozens of conventions which have remained unchanged for generations. Across the ward, a stunning looking young Andalusian nurse, chock full of Moorish genes, looked over and smiled. I’ll never let her change my nappy, I swore silently. Next morning, the battle cry rang out and the Penelope Cruz look-alike approached my bed. ‘Good morning, Señorita,’ I simpered. ‘I have instructions to change your nappy,’ she smiled in a none-of-your-nonsense way and pulled my sheet off. There I lay, in my underpants, nappyless. ‘Where is your nappy?’ she demanded, smiles all gone. The other nurses watched. ‘In the corner,’ and I pointed to where I’d thrown it. I practised my Spanish and learned bits of history from the nurses and medics, who could, in turn, use their English. A good friend, Antonio, was an English teacher and corrected me on his visits. ‘Did you sleep well, Bernardo?’ he asked one early morning. ‘Torquemada?’ he showed his surprise at the mention of their most notorious Inquisitor. ‘Yes,’ I said, ‘his prisoners would have lit the bonfires under their mothers themselves if they’d been made to sleep on this abomination.’ I had fallen into an exhausted coma just before the swallows wakened me swooping in to their tweeting young in nests spit-plastered under the eaves. ‘I’ll see if the bed can be fixed,’ he said. It couldn’t. So Torquemada won. One lazy afternoon I asked about the Spanish Foreign Legion whose H/Q is in Ronda. They all looked proud of this daft but elemental Spanishism. The old man in the ward’s other bed, Carlos, woke up. ‘Stop this Fascist shite!’ he shouted or something like that. The Legion had been formed to support Franco, the far Right dictator. The old boy was a Republican and hated Franco. ‘We had better stop,’ said Teresa, ‘or Carlos will have a heart attack.’ It took me hours to convince him that I was not a Fascist but just loved that marching song. ‘No,’ she said, thinking I’d gone around the twist. ‘We’ll have to christen him then,’ said Nurse Mari-Paz. ‘We’ll invite Carlos’, said Teresa. And so the crowning of Alfonso the Fourteenth took place with a pink plastic bucket as his crown, pink out of respect for Carlos’ political beliefs. He, in the spirit of reconciliation, pronounced Alfonso King of Ronda. Spaniards love joking. When friend Bosco asked why we were learning Spanish, I replied, so that we can understand what you are all laughing at. In this spirit, I’ll miss them all and their battle cry. 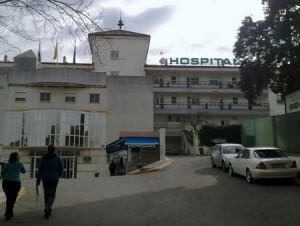 If you have to get sick go to a Spanish hospital. They’ll make you better.